WASHINGTON — One Republican congressman says he’s going to start carrying a gun in public after a gunman opened fire on a baseball practice, injuring Rep. Steve Scalise and several others. Some lawmakers want beefed up security at town halls. Wednesday’s shooting jolted many lawmakers, leaving them feeling vulnerable. And as the political rhetoric becomes more shrill, many members of Congress said they are receiving more threats, by email and by phone. There are 238 Republicans in the House, but 217 voted for a bill that would repeal and replace President Barack Obama’s health law. It was unclear whether the email writer was referring to that vote. Tenney’s spokeswoman, Hannah Andrews, said the office alerted U.S. Capitol Police. Two weeks ago, the Capitol police dispatched two officers to the Houston district of Rep. Al Green, D-Texas. Green said his office got threatening phone calls after he called for President Donald Trump to be impeached. McSally is a Republican from Arizona and Kustoff is a Republican from Tennessee. The U.S. Capitol is one of the best-guarded buildings in the country, but when the vast majority of lawmakers leave the fortress of Capitol Hill, they’re on their own. Wednesday’s shooting highlights the vulnerability of lawmakers when they are in public. Only the congressional leaders have security details. Rep. Chris Collins, R-N.Y., told a Buffalo radio station that he plans to start carrying a gun in public. “It’s going to be in my pocket from this day forward,” said Collins, who added he has a permit. Rep. Jeff Duncan, R-S.C., said he feels adequately protected at the Capitol complex and feels no need to carry a gun. “That’s the wrong way to approach this. We’ve got Capitol police coming out of every office in the Capitol complex,” Duncan said. As majority whip, Scalise is the third-ranking Republican in the House. That’s the only reason members of the U.S. Capitol Police were at the practice — rank-and-file senators and House members don’t get security details. “I think the security detail saved a lot of lives because they attacked the shooter,” said Rep. Joe Barton, R-Texas. Barton manages the baseball team. Two officers were injured along with a congressional aide and a lobbyist. The assailant later died after the incident. Attacks on members of Congress are rare. In 2011, a gunman shot Rep. Gabby Giffords, D-Ariz., in the head during a shooting rampage at a public event outside a grocery store in Tucson. The gunman killed six people and wounded 13, including Giffords. The last sitting member of Congress who was killed in the U.S. was Sen. Robert F. Kennedy in 1968, while he was running for president. Two others were killed abroad. 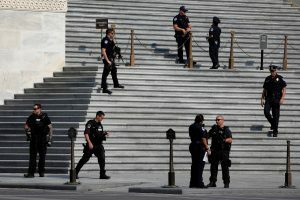 Incidents at the Capitol are more common, even though the ornate tourist attraction is ringed with heavily armed Capitol Police and metal detectors at every entrance. Last year, Capitol police shot and wounded a Tennessee minister who, they said, pulled a gun and pointed it at officers as he was entering the Capitol Visitor Center. In 2015, a former postal worker from Florida flew a one-man gyrocopter onto the lawn of the Capitol. He said he was protesting the influence of money in politics. One of the worst incidents happened in 1998, when a gunman stormed through a Capitol door and shot and killed two members of the Capitol police, detective John Gibson and officer Jacob Chestnut. After Wednesday’s shooting, some lawmakers said they would look into having more security when they gather in large numbers. But with 535 members of the House and Senate, lawmakers said it is unlikely rank-and-file members will get security details unless there is a specific threat. Associated Press writer Melinda Deslatte in Baton Rouge, Louisiana, contributed to this report.